1. 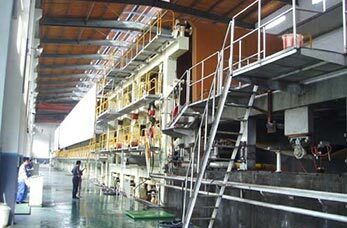 Waste paper is conveyed by 1200mm Belt Conveyor for making fine pulp. 2. The paper pulp will be conveyed into automatic deslagging device ZSC4 high density cleaner to remove heavy impurities in the paper pulp. 3. After the paper pulp entered into CS 100 Low Consistency Pulp Cleaner, impurities like gravel, scrap iron, dust and large ink particles will be cleaned. 4. Screen like 0.6m2 Coarse Screen and 0.9 m2 Mid Consistency Pressure Screen will be used for coarse screening of various waste paper pulp. Leizhan 70t/d kraft paper manufacturing system has an product capacity of 70t/d in the basis weight range of 100 to 200g/m2. Compared to 50t/d kraft paper production system, 70t/d kraft paper manufacturing system has a higher work speed, the design speed is 200m/min.